Granite Countertops and Cabinets are Perfect Renovation Supplements to Your Kitchen Design | Planet Marble Granite & Tile Inc. The season’s mood is going from sunny to somber. It won’t help that the sunshine is getting weaker and the cold air will be whispering icy tales for another 6 months. Of course, we’ll then have one month of joyous carousels and then it’s back to icy gloom. How about this, since there’s nothing much to do outdoors, why don’t you do some home renovations? Let’s start with renovating your kitchen design. May I suggest granite countertops and cabinets? It’s the perfect way of bringing color and life to your home. South Florida Countertops is just in the neighborhood. Our granite countertops and cabinets are the perfect antidote to the pervading dreary atmosphere. Fall is when Persephone descends to the dead to be with her husband Hades. And According to the legend, that’s when every plant on earth refuses to bloom and give fruit. The earth’s color and beauty is drained from its face until spring, when Persephone returns to the land of the living. It’s a very romantic tale but one we can easily forget by creating beautiful and colorful granite countertops and cabinets to offset the Persephone effect. Vinyl, marble, and other engineered stones can also be counted on to make a beautiful transformation for your countertops. But nothing works like granite stones. It’s nature and man working together. Nature provides their natural setting while man is responsible for bringing them out. And the result is nothing short of a miracle. 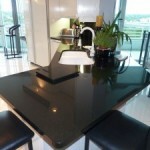 You won’t have anything nearly as bewitching as granite countertops. Why are granite countertops and cabinets lumped together? Cabinets are natural components of countertops. The cabinets have a very important supporting role in making countertops useful. And not only that, cabinets can impart profound effects on the countertops. You can either contrast or unify their colors. The outcome will always be something to be admired. Granite countertops and cabinets can always inspire, being the centerpiece of your kitchens and other parts of your house where they’re impressively enthroned. Because of granite’s versatility, it’s not difficult to match it with other house accessories such as granite countertops with silver sinks and long neck silver faucets. Or you can pair them with brass or chrome colored kitchen cooking ware. It’s just a matter of picking up the right combination and voila, you have the perfect kitchen design! Beauty is in the eyes of the beholder they say. Whose eyes are those we’re talking about? If it’s only yours, I think you won’t be impressed at all. It should be the eyes of all your friends. What’s the use of putting up granite countertops and cabinets if they won’t impress anyone else except you? That’s the reason why we’re here. Your kitchen design ideas or whatever part of the house you want upgraded will always be an integral part of the overall project. It’s your house, it’s your call. And to help you develop your concept, we will show you some color combinations, materials, styles, and designs. We can put them together for you and your approval will be the last word.